I have tried all free services like Playfab to create leaderboards. Why Playfab? Because of great support – if you need help just make a ticket. Playfab Developers are really helpful and open minded! You need to have Visual Studio installed to compile the Blueprints PlayFab plugin. Don’t worry you won’t be writing any code! To install Visual Studio open editor and find File -> Add C++ Code To Project. In new window click Install Visual Studio 2015. It will take some time. When finished restart your computer. In order to move forward you need to download PlayFab SDK. Just use download zip button. Please read the readme file and open client ExampleProject. Try to get your register / login to work using readme file at github site. It will guide you with Playfab account registration and you will get the most basics knowledge about framework. Take time to figure how to register / login! If you are ready just copy PlayFab plugin to your plugins. Make sure you are using Client version. You should watch all of the tutorials made by Playfab – for example about leaderboards. They are in Unity but you will get a lot from them. Playfab uses JSON to store data on the server and you will be sending and getting JSON data as well. When launching the game I’m getting CloudURL as well as is needed to call Cloud Script later. When new hi-score appears I’m calling cloud script which is updating player stat. You will see updateLevelScore function later. It is simple. You are storing player stats using names – in this short example “hiscore” with a value. (SetNumberField) In my case which I will show you later it’s “HiScore_LEVELID”. Getting data is really simple. You can use GetUserStatistics node as well to get the “hiscore” value. Leaderboards nodes gives you arranged players depending on the stat you are referring. You can use this node to test things out but for sending (updating) actual data you should use cloud script. This looks more complicated but it’s not. User just request to call function (in cloud script) with some input (JSON data) and server will give you results using JSON data. var levelname = args.level; // "level" is the JSON string field named "level"
I’m creating empty json data as I want to have one function to update each level scores, and you can’t use args.level in this case. You can learn more about this here. Make sure you have the same function in your cloud script which can be found in PlayFab -> Game -> Server. Just download the file that’s already there. Add this function and upload the file – remember to publish after submitting. That’s all basics information before we move forward with implementation. You should experiment with Example Project provided by PlayFab it’s super easy just learn how to get and set JSON data. I will use ShooterGameInstance for functions / events used for PlayFab. For me it’s the best place as it will be always there even when I will reload the map. PlayerID string This will store player ID which we will get after registering. It will be saved and loaded as well later. PlayerName string Storing player name which will be used to register/login. Saved /loaded as well. PlayerPassword string With registration I will generate random password and it will be stored here. Saved / Loaded as well. Why I’m generating? Just for fun, you can make your password as you want – players won’t see it, but there may be some crackers that will get your hard coded password. That’s why I’m using random one so cracker will know only his password but not others. CurrentBestHiScores Playfab JSON Object Reference – ARRAY Here I will store best hi scores – it’s array because I have couple of levels each array index == level ID. CurrentScoresAtPlayer Playfab JSON Object Reference – ARRAY It will stores scores around player – array as above. PlayerPosition int – ARRAY When downloading scores near player I will store player position in this variable for future use. Array because player can have different positions in different level. Array index == level ID. StatisticsJSON Playfab JSON Object Reference Stores JSON object when sending data to Cloud Script. 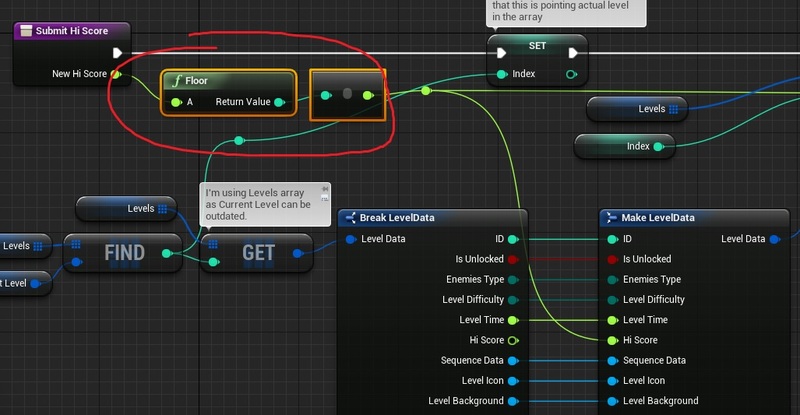 Create new blueprint named “Save_Player” extending form SaveGame and add two strings variables named: PlayerName and PlayerPass. Now go back to ShooterGameInstance and add two new functions. Now I will add some helper functions. USEFUL TIP:String operations cost a lot of CPU and they should be added to C++. Don’t string operations often and in Tick. When changing player name I’m saving it with password right away. I will use this function to print PlayFab errors – it will be easier to debug things. Before start add some dispatchers. Now this add core functions like register, login, getcloudID. This will get current level leaderboards arround player and find player in results – then get the position and set it in PlayerPosition array. Without calling this node Playfab nodes won’t work. Get Cloud Settings URL need to be called if you want to use Run Cloud Script node. Basically I’m getting stats using Select node and saving leaderboard results in array using Insert node as it update value that’s already in that index. Make sure to update this as well. Basically when changing new hi score locally we want to change it on the Playfab server as well. There is one thing left. SubmitHiScore uses float as input and you can’t send float in PlayFab it need to be int. You need to floor the float and then convert it to float again. Normally you will have your score and hi score as int but I wasn’t prepared for that. When calling SendHiScore make sure you used this floored float. Next thing is to prepare playfab on game launch. In Game Instance there is an event called Init. This is starting point for your game and here you can prepare playfab for login. I’m using Init for load as well. Now it’s time to create UI for our leaderboards. First let’s create UMG to show PlayFab errors for example when nick is already taken or there was problem with internet connection. 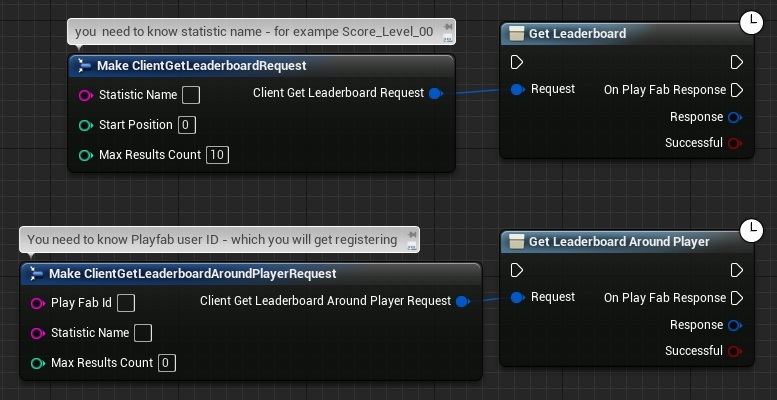 Now open Event graph and add one string variable named PlayerName. So basically each time player will click register game will try to use the PlayerName value to register with Playfab. Simple check if PlayerName is filled. If not – show register screen. So basically it’s filling the data to Text Widgets. If DisplayName is PlayerName it means that this data is from player. Will change colors then to make player more visible in leaderboards later. bShowTopScores bool Default = True. This will tell us if leaderboards is currently showing top scores or scores around player. LeaderboardLevelID int Stores current level ID so leaderboards will know which scores to get. If you read previous tutorials you know that you shouldn’t directly change variables from different classes – use functions instead. This function will fill vertical box with Leaderboar. Now let’s create some custom events. This will basically check if scores was downloaded (array is empty or not) if yes – just pass data to Fill Leaderboard. If array with scores is empty try to download them in ShooterGameInstance. The same thing goes for scores around player. This will check if we want to show top scores or scores around player and call right function. So basically every time ShooterGameinstance downloaded scores this UI will know about it (if visible of course) and will try to update leaderboard vertical box. Easy as that. That’s all – you can add this UI to viewport to check it out. Remember your player need to be logged in. I will be showing leaderboards in level selection screen and in summary. First let’s update UI_LevelSelection. Open Event Graph and add one bool variable named bShowingLeaderboards. Still in Event Graph there are 3 events: OnSelected(UI_LevelIcon_01, 02 and 03) which points to Update Data. I will use those to check if we want to show Leaderboards and if yes – update UI_Leaderboards. This way each time player will click on level – if we are showing leaderboards UI_Leaderboards will be updated with data form that level. This way I’m toggling leaderboards vs level info data. Just hiding / showing things in UI. And that’s all! You can check if everything is working by opening MainMenu_P -> register player -> then show leaderboards. In UI_LevelSelection I Was hiding / showing widgets. Here I will use WidgetSwitcher to toggle from Leaderboards and player score data. Open UI_SummaryScreen created in earlier tutorial. Now open Event Graph and add new bool variable named bShowingLeaderboards. It will toggle WidgetSwitcher to show Leaderboards or score info. It’s checking if Player Position is there in the array for current level ID. If yes – just change PlayerPosition text. If not – try to get the scores as it will update PlayerPosition array as well. It will get us top 3 players. If the score’s aren’t there – try to download it. So basically when this screen appears it will try to get Top Scores (maybe it is already downloaded) and it will wait for Game Instance to call OnScoresDownloaded. If so – update Top 3 players and player position. And then it should work ! I actually had to skip this one. I encountered an issue where anytime the “Decode PlayFab…Result” nodes were used, the game would crash (gameplay window vanished). So GetPlayerPosition and GetTopScores broke the game for me. I spent about five or six hours trying to fix, including updating to the latest version of everything, but no dice. It doesn’t help that Playfab SDK has been updated, so I needed to adapt this tutorial to the changes they made, and it’s entirely possible I did that incorrectly. For instance, instead of using branches to determine whether or not to throw an error, they require bindings to “On Success” and “On Failure” pins anytime you use a PlayFab service, like “GetLeaderboard” or “RegisterPlayer”. I simply deleted the branches here and plugged in the “false” options from this tutorial into the “OnFailure” events for each, and plugged anything that was “true” into an “OnSuccess” event. According to the PlayFab documentation, I’ve done this correctly, and the end result seems like it should match what’s shown here. Really, the wall I’ve slammed into is the “decode” nodes crashing the game. I unfortunately can’t find any info or workarounds for that anywhere. If anyone has any insight into what went wrong here I’m all ears, and I will swing back around to try just about anything you may suggest. In the meantime, I’m moving on to Stats tutorial. Hello Andrzejkoloska i need some helps for the function GetCustomScriptURL, the folder Playfab was update and there is not the same functions. Do you have some issues please?